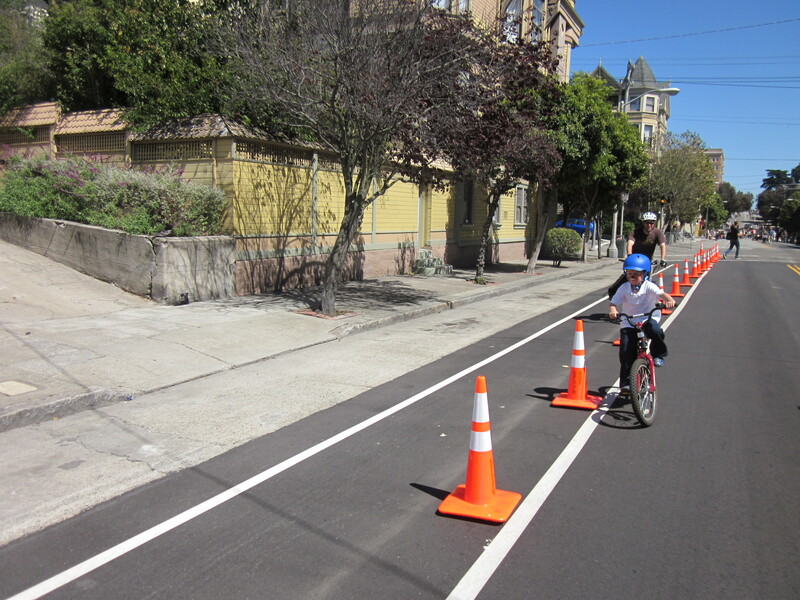 Last weekend we went to the second annual Western Addition Sunday Streets. 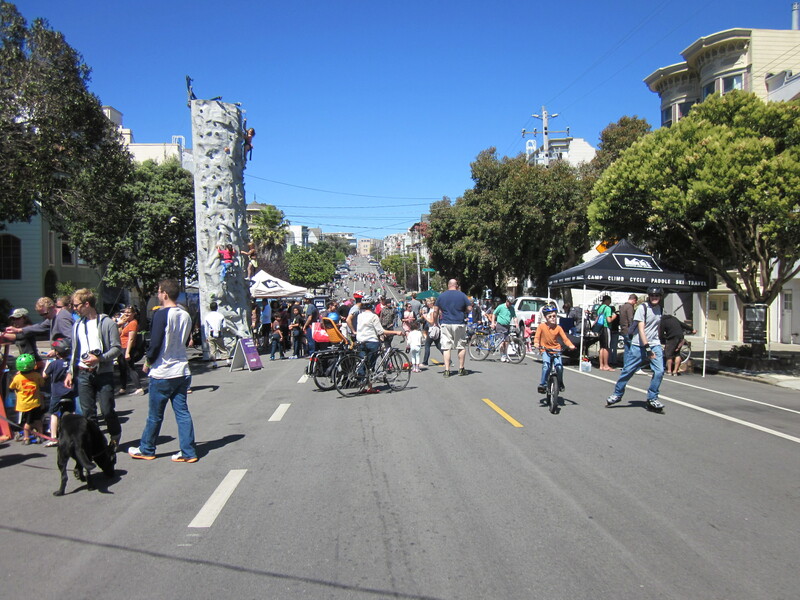 Mission Sunday Streets is an institution at this point, packed with crowds and activities. Western Addition Sunday Streets has a mellower vibe. It’s also a lot closer to home. My son shows off his new skills, weaving through a cone course. 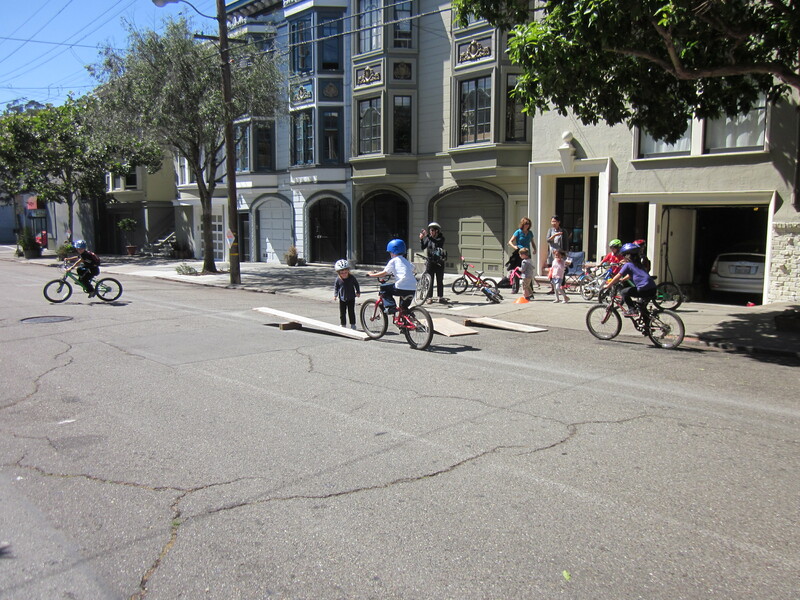 This was the first Sunday Streets we’ve attended where our son could ride his own bike. Over the summer he’s progressed from the back of the MinUte to the trailer-bike to finally riding on his own. 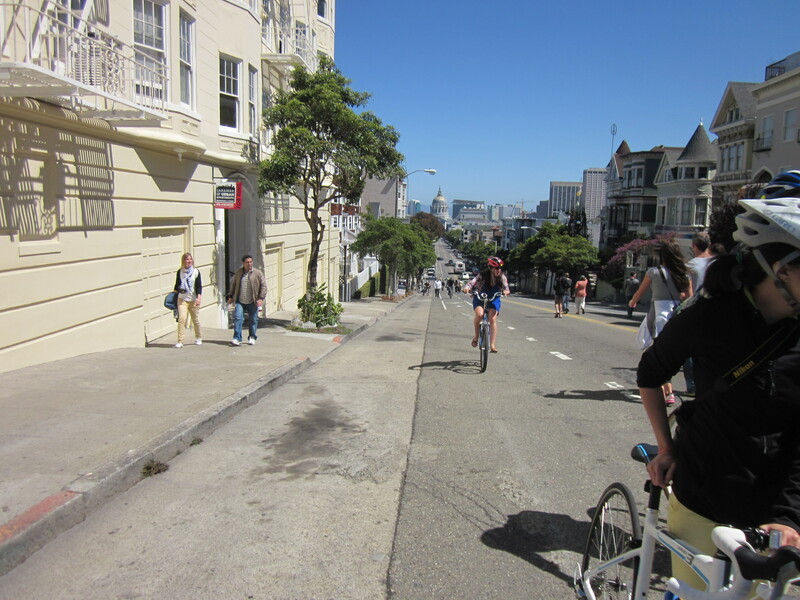 From his perspective, this was the best Sunday Streets ever. Heading west on Fulton Street. Most people walked their bikes here. Unlike the Mission route, the Western Addition route is hilly. It heads up over Alamo Square and over to the Fillmore and Japantown. Our son handled the western approach to Alamo Square on his own, which was amazing to watch. He couldn’t manage the eastern approach, and his ever-more-insistent demands for a bike with gears are pretty understandable. The Western Addition feels less like an event along much of the route, and more like a neighborhood enjoying the weekend. There were rummage sales and lemonade stands and some families put out balls and toys for passing kids. The bicycle teeter-totter was a big attraction, and the neighborhood friends we saw over Labor Day in Golden Gate Park were there with their bikes as well, in addition to our son’s Japanese teacher and her daughter. We never see these kinds of things in San Francisco (lemonade stands!) unless the street is closed to cars. This route covers many of the same streets that we travel when we take our son to school, but it feels completely different. One of the things I like about the Western Addition is that it is one of the most integrated neighborhoods in the city. We stopped by a YMCA booth for face painting right outside a housing project. The projects sometimes look scary from a car, but on Sunday it was just a place to stop and talk with the neighbors. The pies were a hit. We stopped for lunch at the homemade pie shop that Matt has passed dozens of times on the way to school or on the way home from work, but had yet to visit. I had fears that a restaurant with a name like “Chili Pies” wouldn’t have any food our kids would eat given that they shun all things spicy. 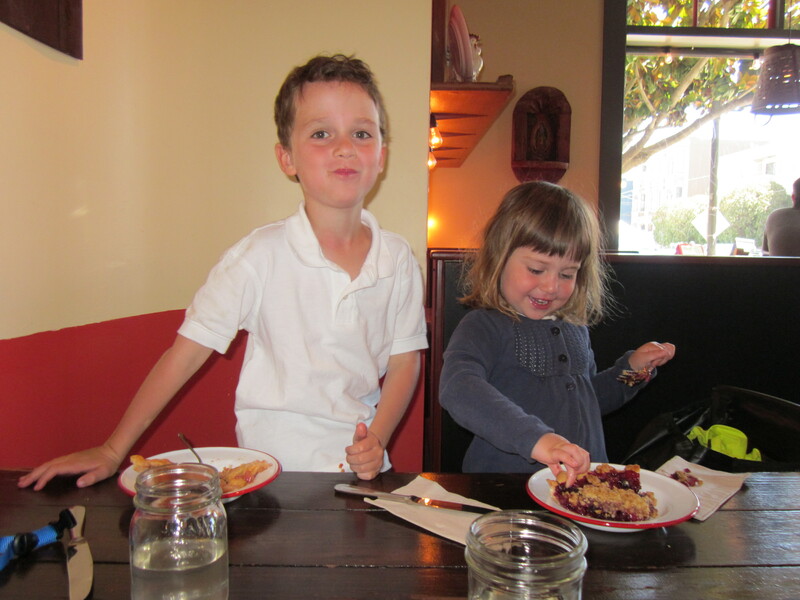 But no worries, they had fruit-only pies as well. And there were three kinds of kale salad. San Francisco, you never disappoint. This bike isn’t in the Public Bikes catalog, which saddens me. Food trucks are so over. 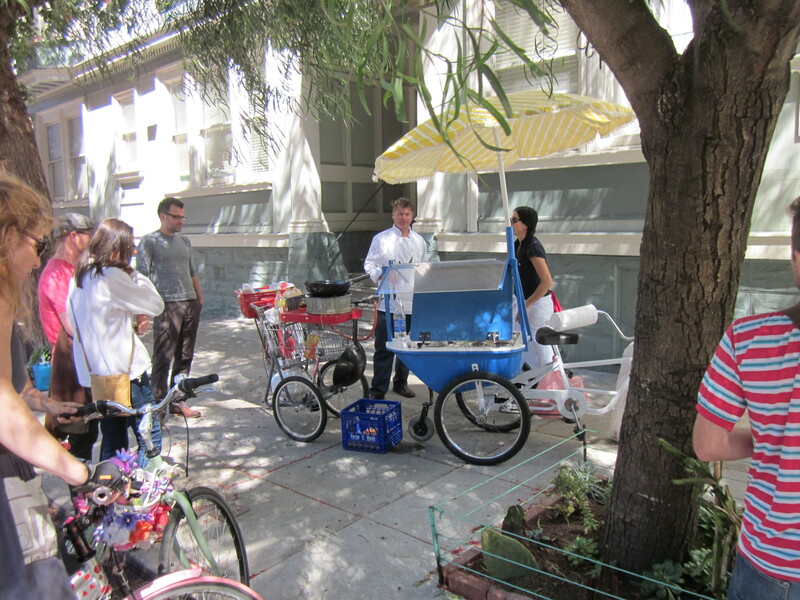 Food bikes are the future. 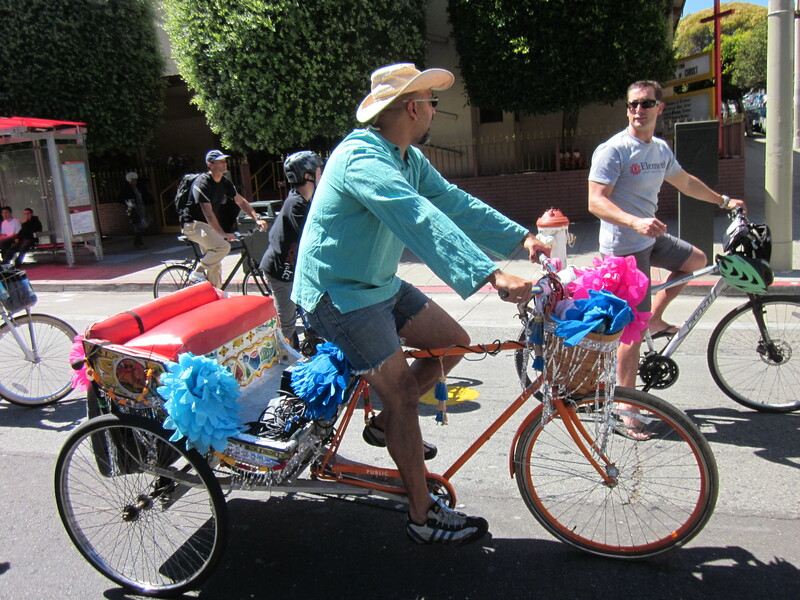 Although these two bikes couldn’t go through most of the route due to the hills, I thought it was so clever that these people were able to capitalize on the popularity of food trucks by setting up food bikes! It’s not the greatest photo, but one bike is welded to a shopping cart and the other is welded to a wheelbarrow. The man is making pad thai in the wok while the woman takes orders. 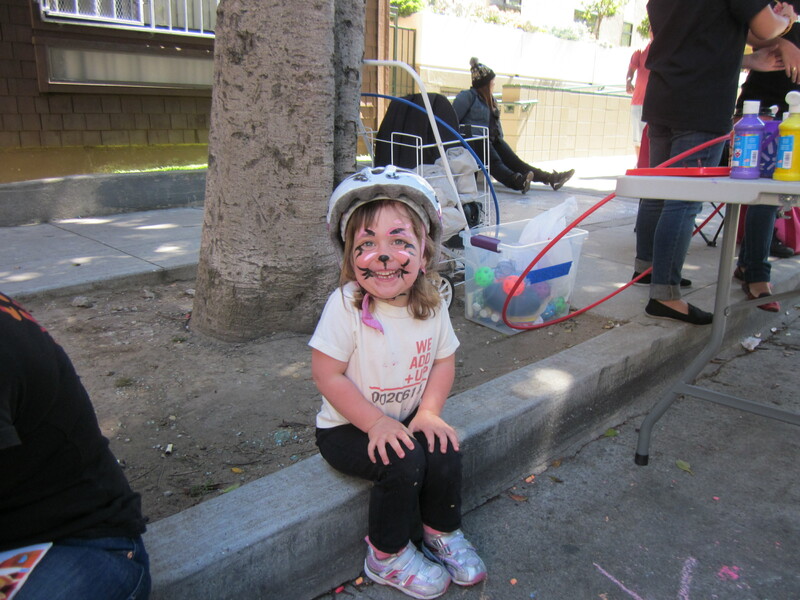 It’s hard to get a sense of what it’s really like at Sunday Streets from pictures. So I took a video. You and your family were really happy last weekend, right? Do people there often hold such a fantastic Sunday street festival? Your son is bravely developing his bike skill, and your daughter was a very cute cat face;). It was a good weekend. Sunday Streets are once or twice a month in San Francisco, from about April to October. Every year there are a few more events. We keep hoping eventually it will be a weekly event throughout the city.